The iPad Photo Booth is a great cost alternative for guests looking to hire a fully inclusive photo booth, and perfect for suppliers who are seeking something to add to their rental portfolio that is quick, easy, and low maintenance. A quick and easy way to cater a photo booth for events with minimum set up, simply switch on an iPad and insert it into this custom build iPad Photo Booth. The iPad Photo Booth is a freestanding iPad stand constructed from solid steel. Embedded within the stand is an LED illuminated backlight panel, speaker holes, and a circular hole removed for the iPad camera lens. There is a key accessible panel at the back of the iPad Photo Booth to ensure the iPad is stored and secured safely. Ventilation holes are also at the back of the stand to ensure a cool air flow. Guests stand infront of the iPad Photo Booth and use the touch screen of the iPad to initiate the pre-installed Photo Booth app. The app uses the iPad camera and sound to provide a fun, yet low cost photo booth experience. You can choose from a great range of photo booth borders or easily import your very own designs to add your personal touch. Final images are set to print on standard 6×4 photo paper so you can print directly on the day or after your event. 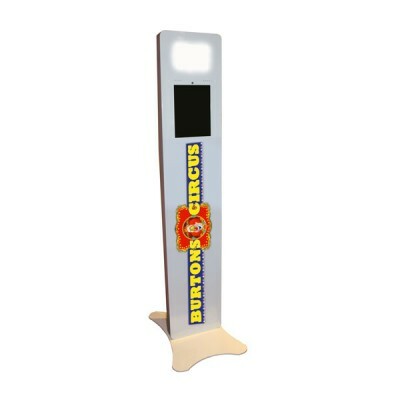 Get your iPad photo booth branded with digital printed graphics. Use the MyPhotobooth app to customise your photos with borders, logos, and personalised messaged. Send any photographs to yourself via email or post to social media.